According to some guys who landed flying saucers at the last meeting of the Flat Earth Society in Utah, where Morgan Frank acts of Grand Superintending Vision Caliph, the rates of inflation Dr. Perry has used in this chart are way too low. 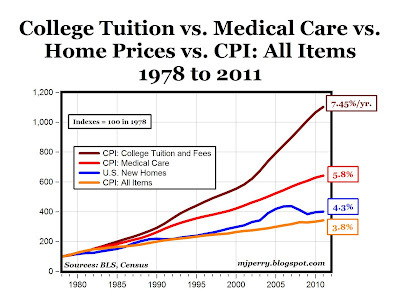 Therefore, in gold terms, indexed to Shadowstats Slide Rules, college tuition is actually less than 20 years ago. How are the college tuition numbers measured? It is well known that over 50% of students don't pay the "list price" of college. I've only seen one study that tried to figure out what the actual cost to students are. Colleges perform tremendous price discrimination. How about the cost of government, total of all levels? more foolish babble from you, what a shock. after the way you embarrassed yourself comment on sharecounts, i figured maybe you'd pipe down for a while, but i see that shame is no more a part of your makeup than intelligence. i think the varnish fumes from your barstools have finally killed your last couple brain cells. It'd be nice to see a graph showing the cost of key necessities: food, clothing, entertainment, transportation, housing, education, and medicine. I suspect the last 3 would be rose crazily since 1970 while the others flattened or declined. I also suspect opinion polls would confirm that the last 3 sectors were a mess, but the others are humming along. Last, the evidence would show the heaviest Federal involvement in the last 3 sectors. "It is well known that over 50% of students don't pay the "list price". t11s, please provide information to support what is otherwise grand speculation. 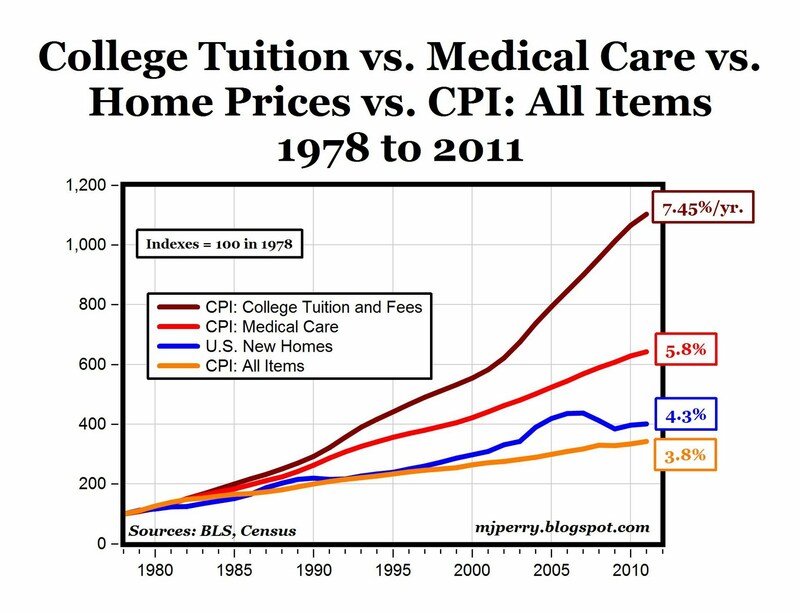 I'm not sure how you get to 5.8% as the current rate of growth of the price of medical care. When I do the math, the percentage increase from a year ago comes to 2.9%, which is what is also found on the BLS website. I'm calculating the average annual compounded rate of increase from 1978 to 2011, over a 33-year period.